i currently have a E-350 van i am outfitting for camping and i was going to use some 36" wide 2-person sprinter seats for extra passenger capacity. 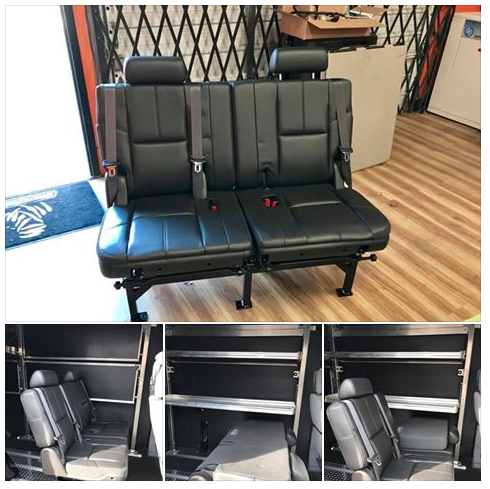 I can not seem to find this info anywhere but i am pretty sure the backs of the seats fold forward and i wanted to know what the height of the seats with the back folded down where. any help would be greatly appreciated as i cant start building the frame work until i get the correct height. If you want a folding seat-back, you have to go to Chevy Astro seats. I'm pretty sure nothing with integrated seat belts that does this, aside from F150 front center seats. Of course, there's bus seats which do this too, which end up an a lot of Sprinters. If you've seen this before, they were probably Freedman seats. sweet thanks guys, im going to check out expedition portal as the seats that MG posted look like they are just about perfect! Oh Yeah! Forgot about SUV seats. 3rd row Expy/Navigator seats as well. But you'd want pre-IRS. Once IRS came out, they became flat-stowing as well. Which could be cool too with the right layout (of course, in a van, it wouldn't be flat. Just much lower). How wide are those seats MG?? Is that your custom base? No worries. I am curious........like a cat. too much so. I got a buddy with a tahoe at work. I'll steal his keys and go measure it up.